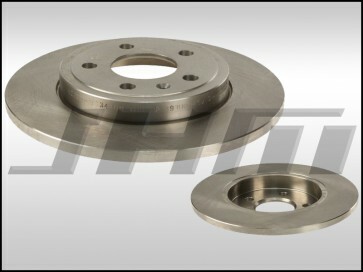 These are high quality OE type replacement rear rotors made by Textar (each) 2 per car required. Adjust quantity in your shopping cart before proceeding to checkout if you need both. The brand rotor you receive will be a matching pair and is based on current available stock. The OEM part number for these rear rotors is 8E0615601M or 8E0 615 601 M.
NOTE: These rotors are priced individually. If you need two, please be sure to change the quantity below before you add them to your cart.